I have read many articles about roc curve and how it works. But im still confused. Can someone please explain me what the points 5, 7, 9 means in the picture below? If you look at the table next to the figure, you can see that each value of the variable T4 is associated with a proportion of true positives (TP) and a proportion of false positives (FP). 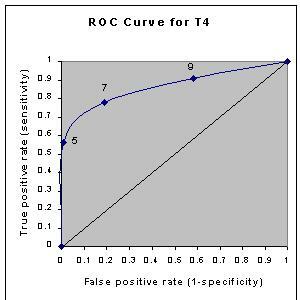 The ROC curve is simply a graph of TP against FP, where every pair (FP, TP) is calculated from a value of T4. What is the convex hull in ROC curve? How is the ROC curve plotted in Viola Jones face detection paper? must ROC curve be concave?